Un film di Gil Kenan. Con Saoirse Ronan, Harry Treadaway, Bill Murray, Tim Robbins, Martin Landau. 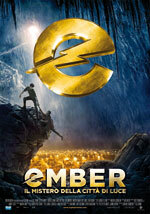 Titolo originale City of Ember. Avventura, Ratings: Kids, durata 95 min. - USA 2008. - Eagle Pictures uscita venerdì 19 dicembre 2008.